The year 2011 marks BerlinaSportivos 5th aniversary, to mark the occation the website has had a complete overhaul, not only making it easier to find the information you are after, but also drastically increasing the amount of Alfa Romeo and Italian saloon car, articles and technical manuals available to all our members and visitors. Don't forget to register and visit our active forum, if you are working on your car and can't find the information in our extensive collection of workshop manuals then pop into the forum and post a question, there is sure to be someone in there who can help. Please take the time to register for the forum, you will find it much easier to find the information you are looking for and will be kept upto date with all website and forum updates. Already a member of the forum then take a few minutes to add your car to the members garage. Share your modifications and problems with the other forum members. Already a member, then add your location to the members map. You never know when you'll need a friendly Alfa fanatic close by. The First translated article has now been uploaded. The original text has been kindly translated to English by a forum member. This weeks upload of articles has just been completed. 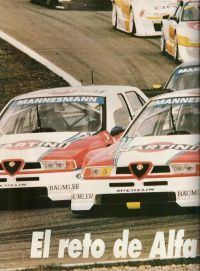 Included are reviews of the 155 GTA and DTM in German and Spanish.